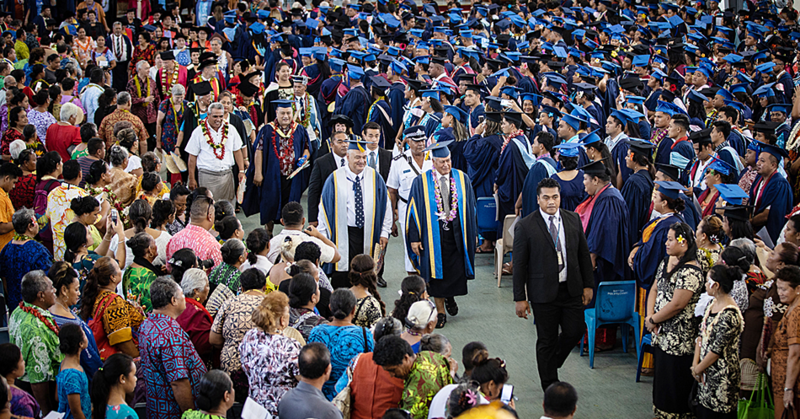 Last Friday over 500-plus graduates passed out of the National University of Samoa (NUS), their graduation from the country’s only university marking the closing of one chapter, and hopefully the opening of another – with full-time employment. Over 520 students graduated with certificates, diplomas, and degrees. Graduates’ families and friends joined the NUS academic staff and their guests at the Congregational Christian Church of Samoa (CCCS) Youth Hall at Mulinu’u to cheer them on. The pressures of those late night assignments, attending lectures, undertaking research, writing essays and field work reports – and everything else that came with university life – is now over! But how many of the 500-plus graduates from the university last Friday will find jobs in Samoa’s private and government sectors as well as churches and non-government organisations over the next 6-12 months? This is the dilemma that graduates and their families now face, especially for a national economy that is still struggling to gain any traction, following the devastating effects of Tropical Cyclones Evan (2012) and Gita (2018), as well as the shrinking of the country’s manufacturing sector. The Asian Development Bank (ADB) recently published a report titled Asian Development Outlook 2019, which was prepared by its staff. It had the theme “Strengthening Disaster Resilience” and also had a report card on the Samoa Government’s overall economic management performance in the 2018 fiscal year. While the report praised the Samoa Government’s first budget surplus in nine years – attributing it to the “rigorous expenditure control” and receipt of higher external grants – it warned of the vulnerability of the country’s tourism industry to natural disasters, and how failure by the Government to consider formulating policies to use infrastructure development to encourage industry diversification could have long-term implications. “Appropriate infrastructure development will catalyze private sector investment as it is attracted to new locations around the country. “The Cook Islands in particular is in a favorable fiscal position to support infrastructure development to spread tourism to outer islands. Samoa and Tonga should incorporate facilitative infrastructure investments in their longer-term tourism development plans,” read the report. The ADB report in fact would have a mixed bag of results for the NUS graduates, as it warned of the dilemma that the Samoa Government faced in its tourism policy, while projecting “accelerated economic growth” in this financial year largely driven by a spike in visitor numbers. “In Samoa, growth is expected to accelerate in FY2019, driven up as higher visitor arrivals boost growth in commerce, hotels, transport, and other activities ancillary to tourism,” stated the report. The report’s optimism in the local tourism industry in the 2019/2020 fiscal years should hopefully give confidence to local investors in the tourism and hospitality sectors, and over the long-term lead to employment opportunities that can open the door to some of those 500-plus students who graduated last Friday. And as the country’s largest exporter earner, more should be done to grow Samoa’s tourism industry, in partnership with local hospitality service providers. Vice-Chancellor of the University of Otago, Professor Harlene Hayne, in her keynote address to the NUS graduates last Friday made reference to the heroics of Pacific Islanders’ ancestors. “Finally, you and your ancestors have been living in the Pacific Ocean for centuries, you are descendants of explorers, of risk takers, who dared dream about the impossible given this, I would like to give you a final challenge, continue to take risks and to continue to dream about the impossible." It was an impassionate plea from the Vice Chancellor of one of New Zealand’s leading universities to the graduates, to remain steadfast and determined in their journey, despite the odds stacked against them and the uncertainties that lay ahead. Perhaps Samoa’s saving grace is in the 2019 Pacific Games, which it has taken on board at such a short notice, and is working to pull off a miracle come the Games opening ceremony on July 7, 2019. We believe in the ability of the Pacific Games Office to tick that box. To those students who graduated from the NUS last Friday and will be on the job hunt over the next 6-12 months, it is important to set your course while on your canoe, ensure your sails are working, and you have rations to last the journey. And don’t forget to look far ahead over the ocean, as therein lies your destination and the land of your dreams. Have a lovely Wednesday Samoa and God bless.